Stu (From Scotland | Working in Kyoto, Japan) on 27 October 2010 in Sport & Recreation and Portfolio. This image just totally says "Japan" to me. The fact that there are no clear faces really draws me in somehow, and the way the colour came out is reminiscent of older times. I find sumo to be an enigma. Japanese folk tend to be small, slightly built folk. 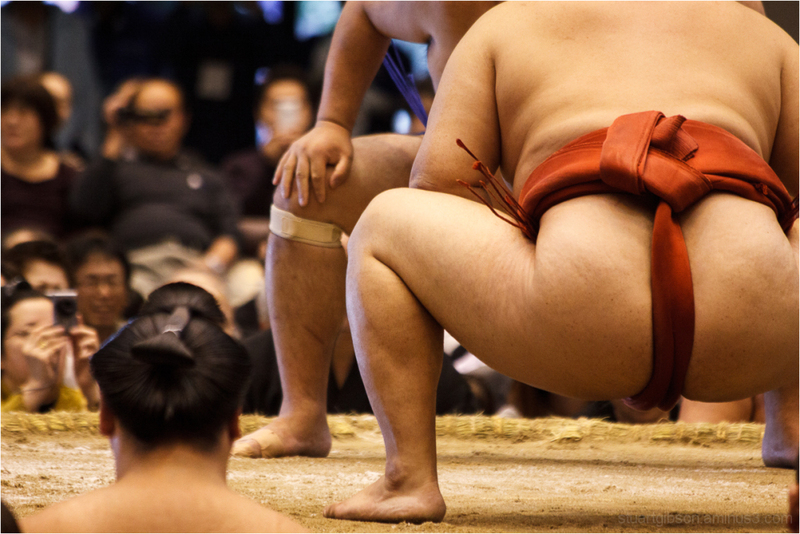 Sumo wrestlers are anything but that... Yes the honour, tradition, ans Shinto undertones are in both , but I think the differences are greater than the similarities. This shot is great, and I think it sums up the power of Sumo and the important position it holds in the Japanese heart. Lovely unusual sport shot and great composition. A fabulous frame. I'm sorry I didn't get to a match while I was there. I did watch the tournaments on TV on my rare afternoon off when they were broadcast. I agree with your choice of framing - it really does tipify the scene.